In cities and towns, one often comes across heaps of garbage on roadsides and poor -- mostly slum dwellers, children -- hovering around the pile. These people are mostly ignored by authorities as well as rich and middle-class elites. Waste pickers are the lowest in the hierarchy of urban informal occupation. The term 'waste picker' was adopted in the First World Conference of Waste Pickers in Bogota, Columbia in 2008 to facilitate global networking and supplant derogatory words like 'scavenger'. Work situation differs greatly across countries but the common thing is that this work is their livelihood and often supports their families. Number of waste pickers in the country is not easily available. Some estimates city- wise have been recorded. For instance, in Ahmedabad, they are estimated to be about 30,000 mostly women and children. In the state of Gujarat, according to a study, there are estimated 100,000 waste pickers. 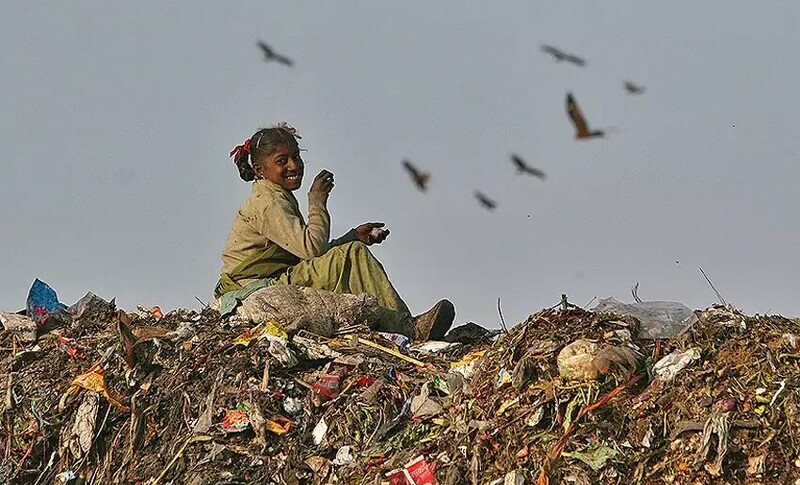 Delhi alone has approximately 100,000 waste pickers according to another study. Pune has 6,000, of whom 72% are women, according to a study. Brazil is the only nation that systematically captures and reports statistical data on waste pickers. Data collected by Brazil's official system found that over 2,29,000 did this work in 2008. According to statistics published in 'Women and Men in the Informal Economy: A Statistical Picture' e where wastepickers have been identified, they represent less than 1% of urban workforce: 0.1-0.4% in seven West African cities, 0.7% in South Africa (including both formal and informal waste pickers) , 0.1% in India. These small percentages, however, represent large number of people. Because of the challenges of gathering data on waste pickers, the estimates may be low. According to some estimates, there are about 1.5 million to 4 million waste pickers in India. They segregate, clean, sort and sell waste to make a living. An IEMS study found that majority of waste pickers had generally low levels of formal education. In many areas, the work was done by disadvantaged groups. For example in Pune, India, the work is largely confined to scheduled castes. Waste picking is generally a family business with flexible working hours requiring little or no education. It is highly adaptable and can be learned easily with little training. For the poorest of poor in the world, it is one of the only livelihood options. However, waste workers often face social stigma, poor working conditions and they are frequently harassed. They suffer from occupational related musculo-skeletal problems, respiratory and gastrointestinal ailments. They face problems from both the police and municipal authorities. They have no social security benefits. According to a study published in the "International Research Journal of Environment Sciences" titled 'Studies on the Solid Waste Collection by Rag Pickers at the Greater Hyderabad Municipal Corporation, India', 94% of the 150 waste pickers interviewed in the Jawahar Nagar landfill in Hyderabad stated that they choose this job as no other alternative was available to them. Thus, many of them are forced to work picking up waste. With the concept of 'e-waste', solid waste management, recycling waste, have made the work of these pickers more valuable. As metals like iron, copper, etc can be extracted from the waste thrown out, these rag pickers can be a valuable addition to the chain of environmental protection cycle. By gathering the material, they can help not only cleaning cities from garbage but also assist in the process of recycling and reusing material so that waste can be used without destruction. Society must recognize value of waste picker and must show compassion. Activists should struggle for uplifting these poverty-stricken workers and force governments to take note of their sufferings. Many of them even work without a minimum wage. Decent wage and medical facility must be given to them along with education and nutrition to the children who are forced into working to feed their parents. Collection centers in cities should provide equipment for gathering and disposal of waste. For clean and green cities and towns (and even villages) , waste pickers are crucial and valuable .